NEW YORK -- There's no trademark on America. The campaign, called "America is in Your Hands," will run from May 23 through November and will include on cans and bottles passages ranging from Pledge of Allegiance to lyrics from "The Star Spangled Banner" and "America the Beautiful." "Budweiser has always strived to embody America in a bottle, and we're honored to salute this great nation where our beer has been passionately brewed for the past 140 years." said Ricardo Marques, vice president at Budweiser. The "America" label will appear on 12-ounce cans and bottles. The new cans and bottles will include images like a magnified view of the Statue of Liberty's torch and Olympic and Paralympic hopefuls. 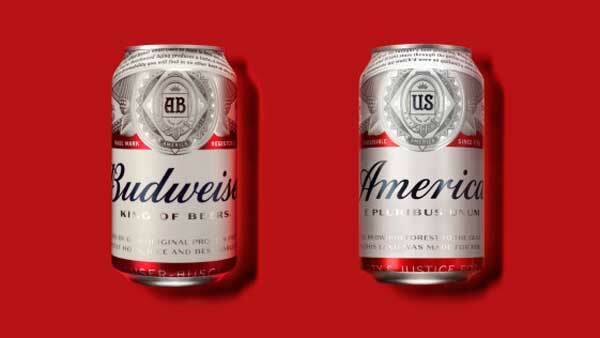 It's not Budweiser's first venture into "America," the brand. A year after the Sept. 11 attacks, the Clydesdales where shown in commercial crossing the Brooklyn Bridge and pausing near the World Trade Center. It's a well-worn path in advertising, particularly as the July 4th or Presidents Day approaches, when Honest Abe hawks used cars or George Washington routes the British in a shiny Dodge Charger with a big, old American flag sticking out of the passenger window.